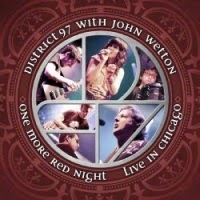 This is a very interesting release by the collaboration of District 97 and John Wetton, entitled One More Red Night (Live In Chicago). As the sub-title suggests, this is a live album and features songs from the King Crimson back catalogue, John Wetton being a member of the said band for the release of Larks Tongue In Aspic (1973), Starless and Bible Black (1974) and Red (1974), from whence all bar one track on this release originate. The sole exception to this era is the track, “21st Century Schizoid Man,” which hails from the King Crimson debut album, In The Court Of The Crimson King. District 97 comprises 5 members, Leslie Hunt (lead/backing vocals), Rob Clearfield (keyboards/guitars), Jim Tashjian (guitar/backing vocals), Patrick Mulcahy (bass) and Jonathan Schang (drums/percussion) with John Wetton providing lead vocals as well. The album One More Red Night is a 9 track release with a total running time of around 43 minutes. The longest track on offer is “Fallen Angel” at 5:47 minutes and the shortest is “Book of Saturday” at just over 3 minutes (3:07). The opening track, “One More Red Nightmare” (4:41) starts with some applause and a voice stating “ we are going to do some King Crimson for you right now” and plunges into some heavy riffing guitar and pulsating, pounding drums. The vocals are far forward in the mix, but appear slightly strained at times and a little “flat” when harmonizing. Some good guitar passages drive the track along through its 4+ minutes and the track is a good opener without being outstanding. At this point, I just realized who the vocal style reminded me of, and that is the early Cream vocals, by the late Jack Bruce. Track 2, “The Great Deceiver” (3:38) has a very similar style sound to the previous track, when the guitar and drums are thrashing away, but there are sections when the tempo switches. The vocals are shared on this track, giving different vocal shadings. “Lament” (4:19) is a gentler strummed intro behind the clear vocals which again are switched between John and Leslie. Some excellent guitar and bass riffing backed by the two vocalists carry this song along. “The Night Watch” (5:31) has a spoken introduction before a longish instrumental section prior to the appearance of the vocals, just before the 2 minute mark. A true “story telling” style vocal almost struggles to get the lyrics into the spaces available. There are some more excellent guitar passages, but I found the vocals disappointing, the wah-wah vocalizations, which seemed at odds with the atmospheric music taking place. Track 5, “Fallen Angel” (5:41) settles back into the superb guitar playing and powerful, driving drumming, but again the vocals aren’t up to scratch and hit very close to being discordant at times. Next up is the shortest track, “Book of Saturday” (3:07) which sits more into the gentler style with simple guitar runs behind the vocals. The attempts to harmonize with vocalizations through this track unfortunately fail to hit the mark. When “normal” vocals are in use, the track starts to come alive, but at only 3+ minutes, it can only hint at being a great track. From the King Crimson debut album, “21st Century Schizoid Man” (5:25) is a fair cover of the original, and indeed is the only track that I recognize from the album. This reviewer is well aware of the impact King Crimson has had on the progressive music scene, but my fascination with the band tended only to last for the first couple of albums, In The Court Of The Crimson King and Wake of Poseidon. “Starless” (4:47) has a spacey keyboard intro with great drums and then some gentle guitar string bending joins in. The vocals for once fit this track very well, although there is still the hint of straining from time to time. The final track, “Easy Money” (5:27) certainly gets the crowd appreciation although the harmonies at the start are a bit rough sounding. The characteristic guitar and drums drive the track along with the keyboards providing a foundation behind everything. One More Red Night is an album I think will appeal to fans of King Crimson who collect all releases related to the band, but as to the wider appeal of the album, I remain less confident. Sound-wise, as a live album, it certainly is a “good un” with clear sound throughout and regular readers of my reviews will be aware that I always approach live albums with a little apprehension. One More Red Night I would describe as an album I found okay, in that there were passages of excellent guitar/drums, but counterbalanced at times with slightly “iffy” vocals resulting in this album probably being an album I would be unlikely to revisit. As always however, this is a very personal view and I would suggest you give the album a listen and decide for yourself.